You can create a new risk assessment or continue with an assessment you have been working on in the Risk Assessment list. To create a new Assessment you click on the ‘+’ icon (1) in the Assessments List toolbar. The following window will then appear. Having chosen the Business Entity (2) and the Evaluation (3) Templates that you wish to work with in the Assessment click “OK” and a new Assessment will be created for you. 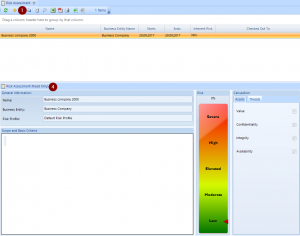 The Assessment information pane (4) will show the basic information about your Assessment along with the level of Security Risk. There is also a COPY function that enables the user to make a copy of an existing Assessment. This will enable the user to create many versions of the same Assessment. To copy an assessment, right click on the assessment that is to be copied and press copy.